Light in the Storm » Blog Archiv » When will the pattern change to cold occur? When will the pattern change to cold occur? One of the primary foundations to my negative NAO forecast this winter is the maintenance of very low levels of geomagnetic activity, which, in my view, has the ability to significantly influence circulation patterns in the stratosphere and troposphere. Last winter lends evidence to the theory, given a negative NAO/Greenland blocking feature dominated the scene in the face of a poor Pacific (raging La Nina) and positive QBO (unfavorable stratospheric wind field). 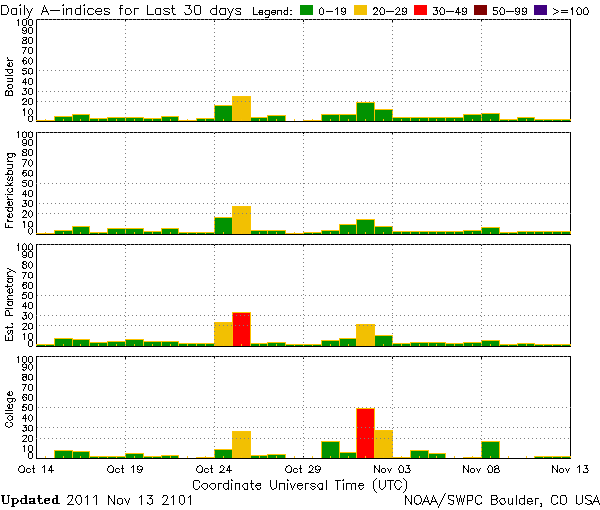 While sunspot activity has picked up somewhat in the past couple years, note the low geomagnetic indicators. 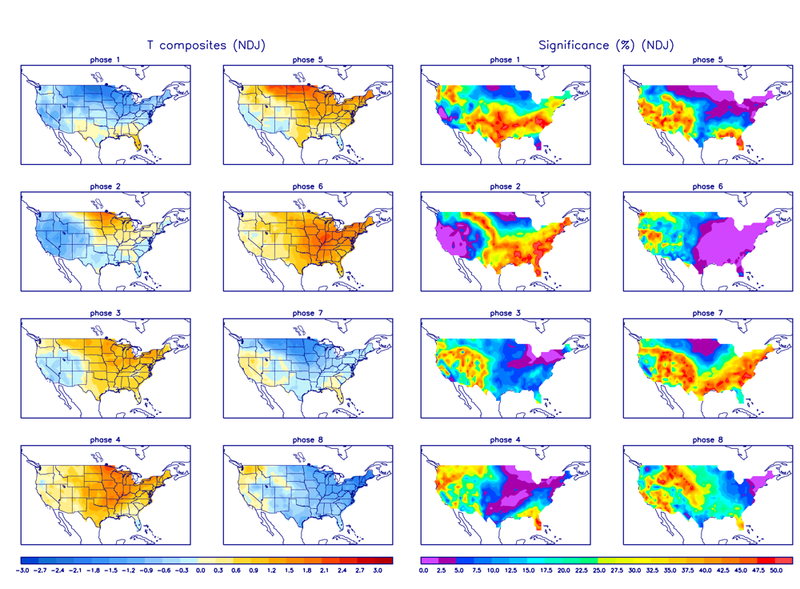 Recent days suggest barely detectable values for both the K index and Ap index. K index – values 3 and under are low; values under 2 are very low. A indices – values under 10 are low; values under 5 are very low. Moving to tropical forcing, which I also utilized in my winter outlook, the MJO will be propagating through octants which are not conducive to the initiation of a -NAO block or sustained troughiness in the Eastern US, for 3 weeks at minimum. Most models are in consensus on a phase 1/2 approach by the end of November, and the Euro ensembles continue to push the MJO wave through phases 3-4 for the first 10 days of December. Phase 5 will likely by reached by about December 10th. All of the above MJO phases mentioned, 2 through 6, but especially 3-5, are blowtorch city for much of the United States. Given the negative PNA/+EPO signal already in place (Gulf of Alaska/Pac NW US trough) coupled with the MJO signalling, the first 10 days of December could be warm to very warm across much of the country. This however is NOT to say the month will continue in this manner. The MJO should continue to progress through octant 5-6, reaching a more favorable phase for Eastern troughiness by mid December. When we combine the future tropical forcing, state of geomagnetic activity, and second year Nina analogs for December, my confidence remains high that December will be a colder than normal month for the Great Lakes/Northeast. In fact, this delay in NAO block initiation may work out in our favor, considering December 1st-15th generally isn’t a snow period anyway, as climatology is quite poor for the I-95 prior to December 15th in terms of large snowfalls. If the pattern change sets in as I expect it to by mid December, it will last longer into January than I originally thought, putting the thaw period later in January rather than taking up a large chunk of the month. Bitterly cold air will undoubtedly build over the snow covered areas of Western Canada over the next 2 weeks; ensembles agree that Canada will turn colder than normal by week 2 – so it’s not a matter of IF the cold air is avaiable. It’s a matter of CAN we get the forcing mechanism to transport this cold air into the Lakes/Northeast in a sustained fashion. The answer to that question should be yes, and it should occur approximately 4 weeks from now. We’ll be in a largely back/forth cold/mild pattern until then – Pacific origin cool air swinging through the northern tier. If December starts off torching, don’t fret, because that’s not likely to be the case for the entire month.